The European Water Framework Directive (WFD; European Commission 2000) introduced a new focus in river management by putting the protection and restoration of the aquatic environment as a key issue on the water policy agenda. This expanded emphasis on restoration activities reflects global efforts to make river management more sustainable by better integrating policy and science to harmonize engineering, ecological, and social concerns in governing river basins. 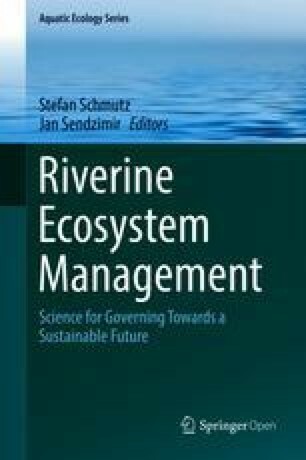 Over the last 20–30 years, several management frameworks such as Integrated River Basin Management (IRBM) or adaptive management (AM) have been developed in a series of separate, parallel experiments to achieve these goals. While specific details may vary, most of these management lineages converged on broadly common ways to sustainably manage natural resources and human activities in river basins in an integrated, interdisciplinary approach. The need to put restoration and conservation activities in a social context is increasingly considered mandatory in recent management programs (see Chap. 16). Various definitions illustrate how diverse restoration activities are perceived and implemented as “restoration,” based on a different, partly contrasting understanding of the general objectives and the methods of restoring river ecosystems. In numerous cases, so-called restoration projects are merely attempts to convert selected sections of riverine systems to some predetermined structure and function, e.g., as spawning areas of a target fish species. Here, as in attempts limited to partial restoration (Roni and Beechie 2013) or to artificial stimulation of natural processes or structures, the term rehabilitation rather than restoration should be used. Furthermore, creation, reclamation, or reallocation refers to the conversion of an ecosystem into a different one and so likewise should not be confounded with restoration (Jungwirth et al. 2002). Briefly, restoration initializes the reestablishment of specific river-type conditions. These processes work to reinforce each other in achieving a self-sustaining status. As such they reflect characteristic structures, processes, and functions of a comparable river/river type with only minor human impacts that corresponds to at least “good ecological and chemical status” of rivers required by the WFD. Thus, river restoration refers to a large variety of measures addressing as key components the morphology and hydrology of rivers as well as measures linked to land use practices and spatial planning. Often such approaches are packaged as bundles of measures directed toward a self-sustaining status by promoting multiple functions and services of river systems in support of biodiversity, recreation, flood management, and landscape development (ECRR 2016). In this chapter, the term “restoration” will be used to refer to any of the above addressed activities. A diversity of concepts and methods is used in restoration science and practice, described in a variety of applications (Kondolf 2011; Wohl 2005; Bernhardt et al. 2007; Palmer et al. 2005; Palmer 2009; Roni and Beechie 2013). The following section summarizes a set of core guiding principles for sustainable river restoration. The beneficial services of river basins emerge from a functional space far wider than river channels. Riverine landscapes can be viewed as expansive systems, whose functional and structural elements are determined by the river and its flow and sediment regime, yielding an intricately connected system consisting of the river and its surroundings (Wiens 2002). Rivers and their adjacent floodplains act as functionally interrelated systems, depending on processes and structures which affect each other mutually, e.g., by floods, habitat-forming and habitat-providing processes, nutrient retention and provision, etc. (see Chap. 3). Beyond the lateral dimension of interaction within a given river site/landscape, those landscapes mostly depend on natural driving forces (e.g., hydrological, bedload, vegetation regime) in its longitudinal dimension of up- and downstream interactions, at the entire river system, catchment, and even the higher ecoregion/biogeographical region scale. Superimposed on these patterns of “natural” interactions are alterations, e.g., barriers, water diversions and impoundments, and land-use shifts, which apply human-induced pressures at the river site or in upstream and even downstream parts of the catchment. Conventional strategies of reestablishing endangered species or iconic images of river landscapes have given way to a focus on process-oriented restoration (Roni and Beechie 2013; see also Sect. 15.2.2). Initial rehabilitation efforts achieved success but only at the local-to-reach scale (Frissell and Ralph 1998). Successful basin level restoration requires a conceptual framework that accounts for interactions within and between all spatial levels. Consequently, restoration concepts for alluvial rivers have to consider the longitudinal linkages between processes at catchment down to reach scale, lateral exchange processes across the floodplain, vertical interactions (riverbed/aquifer), and the effects on biota. This is especially important, as multiple human-induced alterations with cumulative effects most often occur at the larger spatial scales of stream reaches, valley segments, or entire drainage basins. Because these large­scale changes can seriously limit the recovery potential, e.g., of anadromous fishes like salmon, restoration efforts have to be scaled up to address these problems (Frissell and Ralph 1998). The design of restoration concepts must be informed by a deep understanding of the time/space scales of processes that support the functions and features (biotic and abiotic) of river landscapes. As with the restoration of the Kissimmee River (Toth et al. 1995; Wetzel et al. 2001; Whalen et al. 2002), reestablishing natural flood retention functions may be as important as the recovery of indigenous species. A focus on processes (see Sect. 15.2.2) can guide all restoration phases from initiation through long-term monitoring, accumulating success as short- and eventually long-term processes are recovered. In this way, restoration practices can be fine-tuned, strongly revised, or replaced as experience provides the knowledge to improve our understanding and our management policies (Roni and Beechie 2013) (see Chap. 16). As summarized in Chap. 3, alpine rivers are in general characterized as highly dynamic fluvial systems. Their morphology shifts frequently, reflecting “…cumulative responses to recent events and deferred responses to previous events” (Brierley and Fryirs 2005). They can undergo irreversible changes at two levels: internal, e.g., when one channel adjusts to input from a confluent channel, and external, e.g., altered land cover and/or sediment load. This sense of dynamism must inform restoration policy such that it can work with and steer the natural forces that alter the geomorphological configurations of the riverbed, the riparian corridor, and the floodplain. Policies that properly use such natural forces can exploit the inherent capacity of rivers to adapt to such dynamism and “passively restore” them, regenerating and maintaining their ecological integrity and status (Middleton 1999; Jungwirth et al. 2002). Such process-oriented strategies reflect initiatives to make national and international river restoration efforts more holistic (Palmer and Allan 2006) and to better address primary causes of ecosystem degradation through restoration actions (Kondolf et al. 2006; Roni et al. 2008; Beechie et al. 2010). Underlying these recommendations is a history of failed conventional policies that narrowly focused on the recreation of specific habitat characteristics to meet certain uniform habitat standards (Wohl et al. 2005; Newson and Large 2006). Such restoration actions favor engineered solutions that create artificial and unnaturally static habitats. These approaches therefore attempt to control processes and dynamics rather than restore them (Beechie and Bolton 1999). The dynamism of rivers and their associated habitats is evident in how they periodically reshape themselves. Policy can be designed to exploit their natural tendency to “evolve in response to geomorphic processes.” Process-based restoration (PBR) is designed to reestablish the rhythm and magnitude of the processes, e.g., physical, chemical, and biological, which support the functions of river and floodplain ecosystems. Processes often are measured as rates of change or movement of mass or biota in ecosystems (Beechie and Bolton 1999). Process examples include plant succession and growth, sediment transport and erosion, water and routing, inputs of thermal energy and nutrients, and nutrient cycling in the aquatic food web. PBR is increasingly applied in most European countries, especially to renew or recreate type-specific habitats (Kondolf 2011). PBR aims to counter anthropogenic disturbances by setting an ecosystem on a trajectory toward fully functioning processes that require minimal further correction (Sear 1994; Wohl et al. 2005). Restoring key processes increases the resilience of the system to future sources of variation and disturbance, e.g., climate, by increasing the capacity to make physical, chemical, and biological adjustments. Success of PBR can be measured in terms of the recovery of habitat, biodiversity, or patterns of undisturbed river dynamics, e.g., flooding buildup and recession, channel migration, and erosion. By restoring the key functions of undisturbed states, PBR strategies avoid common failures of conventional policies, e.g., piecemeal stabilization of newly established habitats or creation of habitats that are beyond a site’s potential to maintain and will be eventually undone by system drivers that have not been addressed (Beechie et al. 2010). Restoration ecology and practice revolve around the definition of overall goals for restoration as well as the “vision” of what should be achieved in terms of abiotic and biotic conditions. Initially, this idea—called Leitbild concept—was applied primarily in restoration projects in Germany and Austria (Kern 1992; Muhar 1996). The Leitbild—as benchmark for a river status’ assessment as well as for restoration planning—relates to the “natural potential” of a river ecosystem in the absence of “human disturbance,” e.g., unprecedented variation in ecological, economic, or political factors. The general idea underlying this concept has become widely accepted (Kern 1992; Hughes 1995; Hughes et al. 2000). In 2000, this approach was adopted by the WFD for the definition of “reference conditions.” Accordingly, reference conditions correspond to the high ecological status of rivers and should reflect totally, or nearly totally, undisturbed conditions for hydromorphological elements, general physical and chemical elements, and biological quality elements for the surface water body type from those normally associated with that type under undisturbed conditions (European Commission 2000; CIS 2003). In a world where anthropogenic impacts are evident in almost every ecosystem, attaining such a reference state is highly unlikely. This challenge prompted suggestions to replace this reference-based strategy with an objective-based one (Dufourd and Piegay 2009; Bouleau and Pont 2015). This means a strategy that responds realistically to the challenges of establishing sustainable ecosystems by refocusing on achievable and desirable outcomes: the ecosystem services generated by a functioning ecosystem. In a methodological framework of river restoration and management (see Fig. 15.1), this is taken into account by a second step of defining another “benchmark” in terms of “operable targets for the future development of rivers” (“operational Leitbild”). This means to consider framework conditions/limitations, comparable to the “good ecological status,” which, at the very least, should be achieved for surface water bodies, according to the obligations of the WFD. This “two-step approach” moves the Leitbild process from visionary (high ecological status/reference conditions) to operational (good status) stages and at the same time provides an objective and comparable benchmark for the evaluation of the ecological status of water bodies by classifying the deviation from this benchmark according to WFD. In application, this concept serves as a template to define the overall perspective for restoration measures as precisely as possible, and it will help to assess both the current deficits prior to restoration and success once restoration measures have been implemented. It is important to note that the reference condition approach does not attempt to recreate the past or return to a specific, spatially defined previous state, as argued by several authors, e.g., Dufour and Piegay (2009). The advantages of this concept are that (1) definition of the natural, intact system in the “visionary” first step provides an objective benchmark; (2) the natural reference remains valid even under modified frame conditions (e.g., land use, infrastructure, legal situation; Muhar 1994; Muhar et al. 2000); (3) the type-specific visionary Leitbild is based on a holistic approach that accommodates large-scale aspects; and (4) the integrative operational Leitbild encompassing the requirements of all disciplines readily identifies the most feasible solution (Jungwirth et al. 2002). A long-standing and highly reliable method for defining reference conditions is the field assessment of close-to-natural reference sites for the related river type. This is ideally done within the respective river system or the geographical region. If appropriate sites are not available, comparable sites on other rivers should be investigated. In practice, it is often time-consuming to investigate such relatively undisturbed habitats. However, such meticulous approaches will provide the most reliable information, even quantitative data, which is often missing because of its high cost. Collected over several time slots, such “long-term data” can help to define natural variability. Severe hydromorphological modifications of most large rivers in the industrialized world have all but eliminated near-natural reference sites (Dynesius and Nilsson 1994; Nilsson et al. 2005). Efforts to rigorously identify type-specific conditions increasingly rely on historical data (maps and records) from preindustrial eras. These help describe facets of “reference ecosystems,” e.g., communities of aquatic species or geomorphological characteristics prior to large-scale river engineering for transport (channels) and energy (dams) (Muhar et al. 2000, 2008). Most such data was collected for larger river systems, e.g., for the Mississippi and Illinois rivers (Sparks 1995) and also for many large European rivers (Petts 1989; Hohensinner et al. 2008). Surveys have preserved centuries-old data of geography (land surveys), botany, and zoology (plant and animal communities) or decades-long records of hydrology (daily water-level records) and plant and animal surveys extending more than 100 years back (Jungwirth et al. 2002). Spatially based data as well as history-based definitions of reference conditions can be complemented by modeling approaches (Petts and Amoros 1996) as long as a reliable database of sufficient size is available or can be established. The development pathway of a riverine landscape can then be simulated on computer and used as a reference scenario to compare with current conditions. Several reference scenario approaches have been developed in the Netherlands (Harms and Wolfert 1998) where drastic changes to the environmental context of lowland rivers make it difficult to extrapolate from past conditions to the present. GIS data has been used to simulate trajectories of vegetation and fauna in space and time for a landscape ecological decision support system (LEDESS). Alternatively, with current hydrodynamical and hydromorphological characteristics as a “starting point,” one can use the “intrinsic ecological potential” of vegetation and fauna to explore what development paths are possible and thereby define rehabilitation goals (Pedroli et al. 2002; Egger et al. 2015). Nijboer et al. (2004) recommended not to rely only on a single method for defining reference conditions. Rather, complementary methodological approaches should help to “get the full picture.” Finally, all qualitative and quantitative data gained should undergo an expert appraisal in order to review the data with regard to plausibility and potentially complete the reference model by expert knowledge. The processes described above emphasize the core approach for defining reference conditions from a river ecosystem perspective. Equally important as part of an integrative river management process is to define multidisciplinary goals—further specified by setting qualitative or quantitative benchmarks—for other thematic fields. As such, a Leitbild concept was applied as an initially separate initiative that gradually united the “whole restoration community” around one methodological approach, which was then developed into a comprehensive, inter-, and transdisciplinary river management program for the river Kamp (Preis et al. 2006; Muhar et al. 2006; Renner et al. 2013). For example, the definition of problems, goals, and objectives and identification of solutions was done in participatory processes by scientists together with representatives (administration, NGOs, general public) in the field of river engineering/flood protection, sewage treatment, infrastructure, hydropower development, nature conservation, agriculture and silviculture, fishing, and tourism. Development projects framed by only one or two perspectives, e.g., engineering and/or economics, may deliver some short-term profit for intensive investments in a few sectors, e.g., transport, industry, and large-scale agriculture. But the long-term decline of riverine communities highlights how such narrow policies often fail to support all the factors whose functioning sustains ecosystems and society over the long run (Pahl-Wostl et al. 2011; Sendzimir et al. 2007; Gleick 2003). Reversing this decline requires making management more comprehensive by expanding our view from economy far beyond ecology to include society (see above). Efforts to restore streams and river reaches increasingly do so within the broader context of a socio-ecological system (SES) by accounting for the human social and cultural requirements of riverine SES (Wohl 2005). Expanding the frame within which we assess and then manage riverine systems requires more than simply increasing the diversity of expert opinion among academic disciplines. Often citizens active in NGOs or in practicing their livelihoods on or around rivers have experience and insights that are unique and otherwise unavailable to decision-makers. To make such nonprofessional perspectives available, stakeholder participation in river governance is recognized universally (Renner et al. 2013) as an integral component of river restoration practices, especially in design, funding, and authorization of such projects (Bennett et al. 2011). The need for more flexible, adaptive, and integrative approaches to water management (e.g., Gleick 2003; Pahl-Wostl 2007; Milly et al. 2008; Viviroli et al. 2011) has driven experiments in making governance more adaptive through reflective, participatory, and deliberative dialogue (Pahl-Wostl 2002; Rist et al. 2007; Wiek and Larson 2012). These processes and the lessons gained from these experiments are more thoroughly covered in Chap. 16. Restoration must address the cumulative impacts of history while increasing the system’s resilience to the impacts of multiple sources of environmental variation in the present and in the future. Even if human impacts are mitigated, systems will always have to adapt to varying and unpredictable forces. This means that even the best restoration design eventually encounters novelty that could not be anticipated, so learning must inform efforts to adjust policies and practices as the restoration process proceeds. Therefore, the logical core of restoration design is a stepwise process linking a series of logical working phases: river and catchment assessments, definition of restoration goals, selection and prioritization of actions, design of projects, and development of a monitoring program (see Fig. 15.1 step (1)–(8) and also Jungwirth et al. 2002; Roni and Beechie 2013). But, as detailed in Chap. 16, such a thread has to be coiled in a loop that links design with updated information from monitoring as well as changing frame conditions (e.g., advances in restoration methods and practices, changing legal regulations, etc.) so as to promote learning and revision over time. Additionally, in the face of uncertainty arising from, e.g., climate change, learning and adaptation must periodically be ramped up to reset the course of river management. The design process moves forward as each step’s purposes and output informs the next. Examining the environmental conditions, problems, and needs at the macroscale of the catchment is the initial phase of the process. Based on standardized monitoring programs according to the WFD/national legal regulations (Chap. 17), the ecological status of rivers will be identified (see Fig. 15.1) (1). Depending on the individual restoration case/program, this assessment phase will go beyond mere freshwater ecological subjects and will pool data and information obtained across disciplines (water management, flood protection, agriculture, recreation, etc.). This assessment phase should evaluate the environmental status and the “values” and “deficits” of the river and its catchment (3). These analyses help to specify the restoration as well as the conservation needs for the subsequent planning process and, at the same time, to determine whether human impacts have caused changes that are irreversible within any reasonable time frame. For example, no restoration, rather mitigation or rehabilitation, is possible when factors controlling the shape and profile of channels, such as sediment supply and flow, have been fundamentally changed. According to the WFD, such river stretches are classified as “heavily modified water bodies,” requiring deviating goals and mitigation procedures (Chap. 17). Summarizing, steps (1)–(3) identify the critical restoration goals and needs at different spatial scales (river basin down to river reach), which are adjusted and further specified by additional investigations and definitions of reference conditions (3a) as well as of frame conditions and restrictions (3b). Those combined analyses are crucial to finally determine what status can be achieved (4), which then is transformed in an “operational guiding view” (equating to the good ecological status or potential, according to WFD obligations), leading to step (5)—the design of a comprehensive restoration program including the prioritization of actions. A coherent assessment (steps 1–3) and monitoring program (steps 6 and 8) are needed to serve as the basis to determine what potential adaptive strategies are needed within this management cycle than to design the restoration program adequately according to new findings and experiences about the success or failure of individual restoration activities (9). Nilsson et al. (2016) underline the high importance of monitoring and evaluation to avoid problems arising from inaccurate design and implementation of restoration. In sum, to be comprehensive, a program must include the complete sequence of steps from river basin assessment to monitoring, wherein each step is clearly linked to the next by its information output. In the frame of the whole procedure, stakeholder groups will be involved at different extents considering and including their experience, their goals, and their current concerns. All over Europe, river stretches are being restored to achieve the targets of the EU Water Framework Directive (WFD; European Commission 2000), e.g., “good ecological status” or “good ecological potential,” respectively, and to fulfill the obligations of the Habitats and Birds Directive (European Commission 1992, 2009)—using also synergies with natural water retention measures promoted by the Floods Directive (European Commission 2007). However, beside the legal obligations, restoration efforts are more and more targeted to improve other functions or services, e.g., cultural ecosystem services, providing access to and enhancing the attractiveness of rivers and their surroundings for recreational use and tourism (see Chap. 21). An increasing number of restoration projects to date are designed to modify processes that will finally restore desirable, e.g., pre-disturbance, morphology. This is often done by widening to initiate the development of a braiding or meandering river course and by creating new, sinuous river channels and reconnecting the river and floodplain. As such, certain “close-to-natural” morphologies are used as iconic targets to choose the appropriate type of measure, whose achievement suggests significant improvement of a variety of ecological functions. Beside the importance of type-specific restoration approaches, the (length and width) dimension seems to be a crucial criterion for successful restoration. In general, higher restoration effects are expected in larger-scale projects, since longer reaches might better provide a minimum area for hydromorphological processes to act and viable populations to establish (Muhar et al. 2016). Nevertheless, there are only few studies up to now that document higher effects in larger-scale projects (e.g., Schmutz et al. 2014). There are relatively few ambitious restoration programs that address all the multiple pressures that are typical for the majority of alpine river landscapes, e.g., altered flow and sediment regimes (Schinegger et al. 2012; Muhar et al. 2013). Below we provide an overview of common restoration strategies and applications (see Table 15.1) and list several examples of interventions, directed toward improving the morphology and hydrology of river-floodplain systems, such as the interaction of land-use practices with longitudinal and lateral connectivity. The latter will be addressed through detailed case studies in Sects. 15.5.1 and 15.5.2, whereas “morphological restoration” or rehabilitation approaches of river-floodplain systems will be summarized below as the most common and applied measures and exemplified by two good practice cases in Sect. 15.5. Depending on the physical configuration of the individual fluvial system and the diverse forms of human impairments, river restoration may comprise a variety of measures at different spatial scales. Improving instream habitats, in particular those of key species, e.g., salmonids, was one of the principal goals, at least in the first period of restoration activities starting in the 1990s, both in Europe, particularly in the Alpine region, and in the Pacific Northwest of the United States and other areas. Those human interventions were often made at local-to-reach scale. They comprise measures, e.g., restructuring the water-land transition zone by small-scale river widening or enhancing/improving instream habitats through riffles, pools, sediment bars, or wood accumulations. At the same time, such interventions lead to a pattern of diverse flow, substrate, and depth conditions, providing shelter or refuges or feeding sources for aquatic organisms (Allan and Castillo 2007). Boulders, however, should only be used for river restoration where they might function as an integral part of the physical river environment, e.g., in high gradient rivers with coarse bed material. Woody debris are often added directly in the channel, and new woody plants have been reintroduced along the river course to address the lack of any riparian vegetation on riverbanks in cultural landscapes (Reich et al. 2003). Both instream and riparian wood enhancement may improve the diversity of fish and macroinvertebrates, increase storage of organic material and sediment, and strengthen bank stability (Lester and Boulton 2008). Compared to other restoration techniques, such measures have logistical advantages and generally require low costs and low maintenance. Instream woody debris may be used either for improving channel and/or bank stability or facilitating dynamic processes that, in turn, enhance aquatic habitat complexity (Gurnell et al. 2005). In many cases, the success of wood reintroduction as a crucial restoration type that can either re- or demobilize the sediment within the river basin can be limited by other human impairments, such as remote impacts (e.g., dams and reservoirs) or sectional channel narrowing, causing riverbed degradation due to high shear stress and increased sediment output. Over recent decades, widening of river channels has become a major focus of ecological restoration, in particular, in former braided or anabranched reaches (see Chap. 3). Riverbed widening aims to reduce shear stress (specific stream power) and to enhance instream habitat complexity and, consequently, riverine biodiversity. Potentially, it may initiate braiding within a limited area (see River Drava, Sect. 15.5.1). Such restoration measures offer new opportunities for establishing riparian habitats and, in particular, initiate pioneer succession stages (Rhode et al. 2004). New shallow shore zones generally favor fish reproduction and provide habitats for juveniles (Muhar et al. 2008). Removal of bank protections increases lateral erosion processes and instream sediment turnover. Both reduced transport capacity (specific stream power) and increased sedimentation generally lead to aggradation of the riverbed (Habersack and Piégay 2008). As a consequence, water tables may be heightened, which may improve hydrological connectivity to lateral water bodies or to the aquifer. Such effects are common goals of restoration projects from the ecological point of view but might amplify the risk of floods in nearby settlement areas. In regions that are not specifically sensitive to altered flood levels, such side effects of channel widening may be an option for enhancing the flood retention capacity of the respective area (Leyer et al. 2012). Comprehensive restoration of formerly island-braided or wandering gravel-bed rivers (see Chap. 3) involves a doubling or even tripling of current channel widths. This may significantly boost aggradation in the widened river section. In case of degrading channel sections, sediment deposition induced by substantial channel widening may intentionally help to stabilize the bed level (Habersack and Piégay 2008). However, in the longitudinal view, such reaches function as sediment traps, causing increased bedload deficits in downstream river sections as long as a new equilibrium slope has not yet been established. Besides locally implemented measures, the success of channel widenings is closely tied to the available sediment supply from upstream and, in general, depends on a process-based restoration approach using a catchment perspective in river restoration (see above). Laboratory experiments clearly proved that braided channels transform to sinuous-meandering single channels when bedload input is reduced (Marti and Bezzola 2004). This highlights the fact that the consequence of a restoration project does not necessarily mean the restoration of historical channel patterns (see Sect. 15.2.3). Under significantly changed boundary conditions, channel widening may result in alternative states of fluvial systems (e.g., sinuous or meandering), which may potentially also be the goal of such measures, in particular in heavily modified rivers. In multichannel systems, e.g., wandering gravel-bed rivers and anabranching sand-bed rivers, channel widening is also an option to reduce bed degradation or to enhance habitat complexity. Because such river systems commonly suffer severely truncated lateral hydrological connectivity, however, the reconnection of the cutoff side arms channel is the main concern (Buijse et al. 2002). Reestablishing hydrological connectivity between the main channel and water bodies in the floodplains, e.g., side arms and oxbows of the floodplains, which are often remnants abandoned by human interventions, generally amplifies fluvial dynamics and counteracts the predominating terrestrialization processes in the floodplain. Other positive effects are the improvement of aquatic habitat diversity (e.g., when formerly lentic water bodies then become lotic ones), the stimulation of erosional and depositional processes within sustainable limits, and the reestablishment of migration pathways for aquatic species (Jungwirth et al. 2000). Enhanced exchange of surface water between the river and the diverse floodplain water bodies also stimulates the various exchange processes in the aquifer (Amoros and Bornette 2002). Both surface and subsurface flows are fundamental for the improvement of the ecological effects related to the “flow pulse” and the “flood pulse” (Junk et al. 1989; see Chap. 3.4). Nevertheless, reconnection of cutoff floodplain water bodies may also induce new problems from the hydraulic and ecological point of view. Dividing the flow into several river arms reduces the transport capacity of individual channels and may lead to bed aggradation with similar consequences as already described for channel widenings. Though man-made, cutoff water bodies in many cases provide ecologically valuable habitats for endangered, stagnophilic species. Today, such biotopes and their coenoses are often designated as protected natural capital (e.g., an ecological good) according to national or international legislation (e.g., EU Habitats and Birds Directives). Accordingly, “dynamization” measures may lead to difficult-to-solve conflicts involving ecological rebalancing between the reestablishment of system-inherent fluvial processes and of nature conservation levels, such as promotion of endangered animals, plants, and habitats (Muhar et al. 2011). Other potential conflicts to be addressed in restoration programs are the undesirable increases of non-native species or of nutrient influx in biotopes that have been hydrologically recoupled, especially to the river channel (Hobbs et al. 2009; Paillex et al. 2009). As restoration proceeds, fluvial disturbances can trigger the evolution of new habitats from pioneer succession stages. However, though partly restored, the regeneration potential of new habitats can be constrained by vertical decoupling between rivers and their floodplains as a consequence of channel incisions and floodplain depositions (see Chap. 3). If the restoration of former pioneer and softwood forest sites that are characterized by high groundwater levels and frequent inundations is a major goal, the artificial lowering of the floodplain terrain may provide a promising option (compare “Cyclical Floodplain Rejuvenation” in Duel et al. 2001; see also case study Traisen, Sect. 15.5). Mitigation of the ecological consequences related to progressive terrestrialization is also a critical ecological objective along meandering or anastomosing rivers in lowlands (Buijse et al. 2002). Along meandering rivers, improvement of flood conveyance capacity has been achieved by cutting off meander bends, a wholesale straightening of the course and in cases by a widening of the channel (resectioning). Accordingly, restoration measures on channelized meander rivers today comprise the enhancement of lateral hydrological connectivity by reconnecting former meander loops and promotion of the natural inundation regime. Since straightening of the main channel is often accompanied by a distinct incision that lowers the bed, leaving the former meander loops (oxbow lakes) stranded up to several meters above the current elevation of the river (Muhar et al. 2011), reconnecting such oxbow lakes would result in a largely drainage of the water body. Therefore, to adapt to this rebalancing as it occurs, management should experimentally probe for ways to restore lateral connectivity (e.g., reconnection only at higher flows or evolution of new, deeper lying oxbows). A promising solution from the ecological point of view includes the removal of bank protections and the initiation of channel migration. Depending on the external channel controls, self-adjustment processes may lead to the evolution of new meander bends over the mid to long term (Larsen 2008). Because such measures may counteract the general objectives of flood protection, channel shifts and, consequently, sinuosity may be improved only within a limited channel belt that functions as a flood channel at higher flows. The described measures for restoration of channelized river sections highlight typical management options related to specific morphological river types (see Chap. 3). Apart from these a multitude of potential small and large restoration measures exists owing to the complex nature of fluvial systems and different forms of human impacts (e.g., Calow and Petts 1994; Rutherfurd et al. 2000; Brierley and Fryirs 2008). All the schemes implemented at the local or reach scale have in common that they are closely interlinked to the sectional and basin-wide boundary conditions (Gurnell et al. 2016). Depending on the extent of the individual measure, nonlinear channel adjustments that may affect longer river sections up- and downstream have to be considered. The River Drava (Drau in German) is part of the Danube catchment, with its source in Italy, close to the boarder to Austria and its mouth in Osijek (Croatia), where the river joins the Danube River after 748 km. The Austrian section of the River Drava flows 264 km along the border between the Central Alps and the Southern Alps, characterized by a catchment area of 12,058 km2, respectively, out of a total of 41,000 km2. Until approximately 140 years ago, the Upper Drava was a free flowing, meandering mountain river with numerous braiding stretches due to alluvial cones where its tributaries entered. In this dynamic river system with its annual floods and high bedload transport, the river course frequently changed. A braiding river-floodplain system with large gravel banks and extensive softwood forests as well as wetland meadows characterized the valley bottom. The first substantial human changes began with the building of the railroad line through the Upper Drava valley in 1868. In the following years, river engineering channelized the river to reduce flood risk as well as to allow intensive agricultural land use and the expansion of settlements. When the river was forced into a single main channel, the river dynamics were restricted, and the number of side arms, gravel banks, water bodies and vegetation populations in the floodplains decreased. Riverbed incision occurred due to the regulation processes, e.g., torrent control structures, and to reduced sediment supply by the tributaries. This incision reduced groundwater levels, causing desiccation of the remaining adjacent wetlands. In 1998, the river and its riparian zones became protected by designation as a Natura 2000 area. Between 1999 and 2011, two consecutive EU LIFE projects were implemented in the Upper Drava River (across a total length of 80 km) under the title “Restoration of the wetland and riparian area on the Upper Drau River” and “Life vein-Upper Drau river”. These projects defined goals such as species and habitat regeneration and protection as well as water management interests. The overall and most fundamental objective was halting further riverbed incision and recoupling the main river and its side arms and floodplains and even the stepwise rising of the river bottom. This has been the essential prerequisite for all follow-up activities aimed at an increased lateral connectivity and habitat improvement of the river/floodplain corridor. Approximately 30 km of bank protection structures were removed to enhance lateral erosion, which leads to increased sediment input and contributes to the development of gravel/sandbars and islands (see Fig. 15.2a and b). Additionally, numerous local instream measures and several large-scale riverbed widenings including new side arms were initialized. Furthermore, in the adjacent areas, the development of new water bodies and floodplain forests began, providing adequate habitats for animal and plant species that were typical prior to river engineering impacts. In total, about 1/3 (about 25 km) of the former straightened river was restored, addressing the river-floodplain system as a functional unit and offering room for dynamic processes and self-development of the river course. Approximately 25 ha of river habitats were created or initialized in the floodplain area. The restored river stretches comprise habitat types according to the EU Habitats Directive [e.g., dynamic gravel banks (3220) and tamarisk and willow pioneer communities (3230, 3240)], which will further develop to alluvial forests (91 E0). The Upper River Drava (Carinthia) is one of the most comprehensive and well-monitored flagship restoration cases in the Alps and even in Europe. It is one of the large-scale good practice examples investigated within a standard monitoring program financially supported by the LIFE instrument as well as a recently finished EU project (REFORM 2011–2015). Results demonstrate that spawning habitats for amphibians and fish, in particular the Danube salmon (Hucho hucho), grayling (Thymallus thymallus) and Souffia (Leuciscus souffia), European bullhead (Cottus gobio) and the Ukrainian brook lamprey (Eudontomyzon mariae), successfully increased that, e.g., two plants which were both nearly extinct in Austria, could be reestablished again: German tamarisk (Myricaria germanica) and the dwarf bulrush (Typha minima). See also (Unfer et al. 2011; Schmutz et al. 2016; Muhar et al. 2016; Poppe et al. 2016). The projects aimed to increase natural flood retention, to achieve good ecological status, and to provide an appropriate river landscape for additional ecosystem services, e.g., recreation (Chiari 2010; Böck et al. 2015), by a synergistic restoration approach. In general, the projects were designed to reduce human intervention as much as possible and to promote dynamic, self-sustaining river processes. Very long period and intensive process of implementation of restoration measures (slowly built up, starting with ecologically orientated flood protection measures in 1990s, ended up in two EU LIFE projects). Adaptive management approach—stepwise process of implementation—monitoring and practical experiences and adaption of the restoration approaches. Intensive process of stakeholder involvement (from local to national level: general public, different actor groups, administration). Broad communication and documentation of the project (gained wide acknowledgement at regional up to international level; excursions, documented as best practice example in international literature). Open-minded and engaged partners at different administration level/responsible persons (administration, planning offices, researchers) have their specific interest in this project. Mutual confidence (no decisions over the head of the people; flood protection continues to be guaranteed). Stakeholders recognized the synergistic of the projects, e.g., in terms of ecosystem services (flood retention/protection, restoration/ecological functions, land use, recreation/tourism). Stepwise, more process-based approach (River Drava is developing its own course). Dynamic processes are allowed and supported until predefined benchmarks. Until the late nineteenth century, prior to channelization, the lower course of the Traisen River featured typical alpine bar- and island-braided river patterns. Almost 1000 km2 large catchment is located in Lower Austria, stretching from the Northern Limestone Alps in the south over the Alpine Foreland to the north, where the river discharges into the Danube River 55 km upstream from Vienna. While mean flow at the mouth only amounts to 14 m3/s, the river still shows a torrential behavior during floods, with approximately 800 m3/s discharge during 100-year floods. Owing to its alpine character, gravel constituted the dominant substrate type, and softwood communities dominated by willows, alders, and poplars developed in the riparian zone. The mouth of the river is located in the extensive floodplain of the Danube River that was designated as a Nature 2000 reserve according to the EU Habitats (FFH) and Birds Directives. In the course of the construction of the hydropower plant, Altenwörth at the Danube River between 1973 and 1976, the estuary of Traisen River was relocated 8.5 km further downstream, just below the weir of the new power plant. The reason therefore was the uplift of the water table in the impoundment, which otherwise would have required a costly pump station for pumping the discharge of the Traisen into the Danube reservoir. The relocation of the river mouth involved the lengthening of the river channel through the Danube floodplain in the form of a straight canal (bypass) with a double trapezoidal profile for mean flow and floods. In addition, check dams to back up the water at mean flow were installed in combination with flood protection levees along the riverbanks (Fig. 15.3). The artificial channel lacked longitudinal and lateral hydrological connectivity, which inhibited fish migration, and dredging prevented bed aggradation as well as the formation of new instream habitats. Over recent decades, ongoing deposition of fine sediments (silt and sand) during Danube floods has increased the terrain level in the floodplain. Both the artificially incised bypass canal and the elevated floodplain terrain resulted in lower groundwater levels and, consequently, drier site conditions for riparian vegetation. 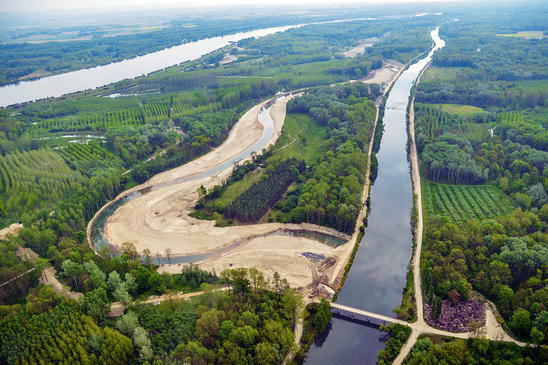 During the EU “LIFE+ Project Traisen” between 2012 and 2016, a new, significantly wider river channel more than 9 km long was excavated parallel to the bypass canal for reasons of ecological restoration. Restoration to its pre-engineered state was prevented by current physical conditions, e.g., a much lower channel slope due to the lengthening of the river in the 1970s and missing bedload transport. Consequently, instead of the originally braided channel pattern, a sinuous, partly meandering channel and several secondary water bodies were excavated (Fig. 15.4). Largely devoid of bank protections, the river can adjust and shift its new bed within a limited area. Introduction of large wood structures and future mobilization of riparian vegetation due to lateral bank erosion will additionally contribute to habitat diversity. In order to initiate new pioneer and softwood communities, 54 ha of the adjacent floodplain terrain were artificially lowered by several meters (Fig. 15.4). This measure shall guarantee an intensified interaction with the aquifer. The old canal from the 1970s will remain as a backwater system connected to the new river channel and will additionally function as a flood bypass. Both the type of measures and their dimensions make this an outstanding example of river restoration. To date, in Europe, only a few restoration projects exist that are comparable with the “LIFE+ Project Traisen.” Consequently, there is an EU-wide shortage in distinct experiences in such projects. In addition, the approximately 9.5 km long restored river section replaces an artificial canal rather than a former natural and later channelized river reach. Considering these framework conditions, the project can be seen as a large field observatory that helps to investigate pending research questions. How intensively will the channel change in future? What are the annual channel migration rates? How does the river cope with missing bed load from upstream sections? Will neophytes dominate the colonization of the new large gravel bars? Which fish species will adopt the new river course as habitat? A comprehensive monitoring project will help to answer such open questions in the following years. It is assumed that the wide gravel channel will become narrower within a few years as a consequence of missing bedload transport and deposition of fine sediments on the new bars. Initial monitoring results show that native willow communities will successfully establish on the new vegetation sites and rheophilic fish species are using the new possibilities for migration from the Danube River to new habitats and spawning sites in the Traisen River. One of the largest river restoration projects in Europe that was implemented in a relatively short period of time. Besides the river channel, the project also includes various floodplain biotopes, such as abandoned arms, alluvial ponds, and 54 ha of floodplain terrain, which were artificially lowered in order to improve the establishment of natural vegetation communities. The restored river section replaces an artificial bypass canal from the 1970s and not a former natural river section. Accordingly, no direct comparison with the natural state of that river section can be made. The given physical framework conditions, such as missing bed load, predominance of fine sediments, reduced fluvial dynamics, etc., will lead to a new morphological state of the restored section. Here, the newly constructed channel functions as a starting situation for future hydromorphological changes. The project was implemented in an outstandingly integrative manner. Initiated by the Institute of Hydrobiology and Aquatic Ecosystem Management (BOKU Vienna) and by the landowners of the project area, the restoration was also strongly supported by the federal and provincial administrations and politicians, by the Danube waterway authority (via donau), and most of all by the operator of the Danube hydropower plant Altenwörth (Verbund AG) that functioned as the lead partner of the project. In the last decade, considerable progress has been made in river restoration activities—in terms of (1) more integrative approaches to planning, implementation, monitoring, and adaptive revision of policies and practices, giving higher attention particularly to stakeholder participation; (2) type and dimension of restoration measures, which have been implemented; as well as (3) increasing awareness of the importance of monitoring programs. Nevertheless, the success of habitat restoration in channelized rivers is constrained by several factors. Locally, along the channelized rivers, the availability of space lateral to the river channel is often limited due to the intensification of land uses and the enlargement of settlement areas. Remote impacts, such as severely truncated sediment supply and altered flow regimes, inhibit the recovery of the original river-type-specific fluvial processes and dynamics. Though the importance of basin-wide sediment management to prevent further bed degradation and to improve habitat diversity has been internationally recognized by water authorities, an integrative solution of that question is still pending. Long-term legacies of channelization, such as vertical decoupling of the river and floodplain levels up to several meters, have significantly changed the hydromorphological configuration of alluvial river systems. Ongoing challenges to successful restoration are currently demonstrated by the persistence of large-scale impacts, e.g., extensive areas of intensive land use in the catchment or numerous migration barriers (weirs, impoundments, ramps) limiting the recolonization through interrupted longitudinal connectivity. Moreover, current fluvial systems are confronted with multiple pressures that cannot be solved solely by morphological habitat restoration (Schinegger et al. 2012; Tockner et al. 2010; Hering et al. 2015). This calls for further improvements to an integrative and basin-wide approach that goes beyond fluvial morphology to account for all functional aspects of river systems.